Quick: what’s America’s preferred condiment? Ketchup? Mustard? Mayo? No, mis amigos: it’s salsa. Born in pre-Colombian Mexico, this ancient condiment uses every flavor blaster in the New World arsenal—chilies, tomatoes, alliums, citrus, even squash seeds. And if you think salsa comes solely tomato red or tomatillo green, you haven’t experienced melon, papaya, or pineapple salsa. You should. Think of salsa as edible house music: the mellow fruitiness of tomatoes or tomatillos (yes, botanically both are fruits) electrified by fresh or dried chilies. The buzz of fresh lime or naranja agria (sour orange juice). Aromatic bursts of cilantro, scallion, or onion. It’s hard to think of another condiment that starts with so many aggressive flavors, yet winds up a harmonious whole. You’d no more eat totopos (tortilla chips) without pico de gallo than you’ve serve pok chuc (Yucatecan brined, grilled pork) without xni pec (fiery “dog’s nose” salsa—more on that below). Carne asado and other Mexican grilled meats would taste downright naked without salsa verde (green tomatillo salsa) or salsa chipotle. Salsa is quick and easy to make—indeed its essence is its spontaneity. Big in flavor, but low in sugar, fat, and calories, it just might qualify as health food. But which salsa? In Mexico, you find literally hundreds to choose from. Here—just in time for Cinco de Mayo, Mexico’s Independence Day—are five of my favorites. Pico de gallo: This salsa—also known as salsa fresca and salsa mexicana—is a piquant mash-up of fresh tomatoes, jalapeños, onions (or scallions or garlic), cilantro, and lime juice and served from one end of Mexico to the other. It’s relatively mild as salsas go—the jalapeños, dosed with a measured hand, give the salsa bite, not hurt. (The name literally means “rooster beak.”) Serve with tacos, fajitas, nachos, shrimp or lobster, chicken or skirt steak. Xni pec: In the Yucatan, folks like it hot—real hot—hence the popularity of this “dog’s nose” (literally) salsa, made with fire-roasted habañero chilies (talk about smoky heat), tomatoes, onions and naranja agria (sour orange juice). It’s a complex play of flavors for gustatory thrill seekers. There are several theories on its curious name: it bites like a dog, or perhaps it makes your nose runny and wet, like a canine’s. Salsa borracha: Fortified with beer and a vivifying shot of pulque (a fermented agave cactus drink) or tequila, this “drunken salsa” traditionally accompanies barbacoa—the pit-roasted lamb or goat for which you should hop a plane to central Mexico. Salsa borracha owes its mahogany color, smoky flavor, and gentle heat to the wrinkled dried pasilla (“little raisin”) chile. Just before serving, the salsa gets a sprinkle of crumbled salty cheese, like Mexican queso fresco or cotija. Slightly bitter and piquant, this is not the sort of salsa you’d normally serve with chips. But pair it with pit-roasted meat and you’ll see fireworks. Salsa de arbol: Born in the ranchlands of northern Mexico, this pyromaniac starts with fiery dried red chiles de arbol, which you soak in warm water until pliant, then blend with fire-charred tomatoes, onions, and garlic and fresh cilantro and lime juice. I first experienced it at a funky steakhouse in Juarez, Mexico, called Mitla. And mesquite-grilled T-bones have never tasted the same without it. Salsa chipotle: There once was a time when it took some serious hunting and gathering to source these Mexican smoked jalapeños. Today, chipotles are everywhere, starting with the eponymous restaurant chain and continuing to the ethnic foods section of your local supermarket. You probably have some in your fridge. Originally, the chiles were smoked to preserve them; now they’re smoked to add flavor. Salsa chipotle is a cooked salsa—made with tomatoes and tomatillos—the latter a tart green fruit incased in a papery skin and related to the gooseberry. Traditionally, the vegetables were charred on a comal (flat cast iron skillet), but you’ll get more flavor by searing them on a hot grill. Serve with grilled seafood and poultry and enchiladas. 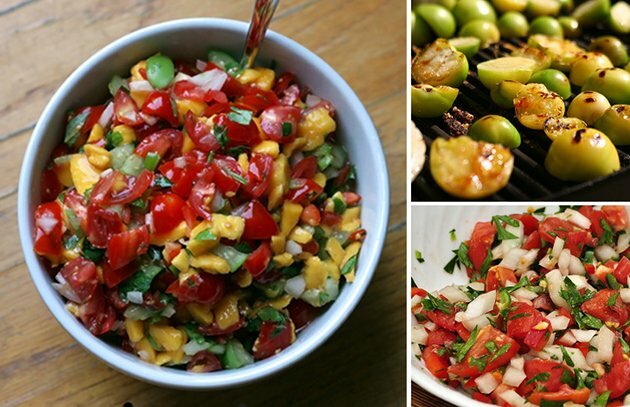 What’s your favorite Mexican salsa? Tell us about it on the Barbecue Board.